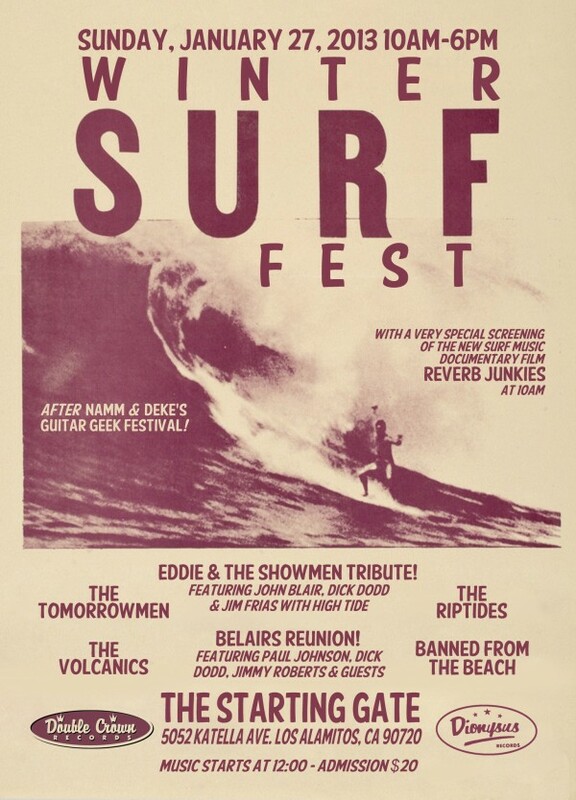 Surf Music Events of the Year! Summer really is a state of mind, especially during the cold months in Southern California. Nothing can prove it more than the right live musical soundtrack. For many fans the world over, this soundtrack is Surf Music, the instrumental genre created in the early 60.s by legendary bands such as The Belairs and Eddie & The Showmen. Helping to keep this instro torch alive and well are the members of the online forum SurfGuitar101.com, who have put together some of the most significant live Surf Music events in recent years. The 2nd annual Winter Surf Fest will continue along these lines, featuring an entire day of the reverb-drenched goodness, complete with rare tribute and reunion performances, and the US public debut screening of the new Surf Music documentary film Reverb Junkies. This special Sunday event coincides with one of the most important music weekends in Southern California that includes Deke Dickerson’s Guitar Geek Festival and the NAMM trade show in Anaheim, and the So Cal World Guitar Show at the Orange County Fairgrounds. –A very special US public debut screening of the brand-new Surf Music documentary film Reverb Junkies at 10AM, with the filmmakers present. DVDs of the film will be available for purchase.